Get the finest gear from Crutchfield, North America's Electronics specialist since 1974. Call 1-800-955-3000 to redeem your cards and get personalized expert guidance from our Advisors. Or redeem your cards at crutchfield.com or at any Crutchfield retail store. There's no expiration date and no fees. Use the cards yourself, or let your friends and family members shop for the gear they really want, all while experiencing our great service at Crutchfield. And, as a bonus, we offer free tech support on any item you purchase, so we're there to help if you have any questions when you're setting up your new gear. National Gift Card is the best place for you to order Crutchfield gift cards in bulk. We are the experts in all things gift cards and can set up your gift card solutions program for you today. Please contact us for more information on Crutchfield bulk, direct-to-recipient, or individual gift card fulfillment for your gift card program. Contact us here or call us at 888-472-8747 today! 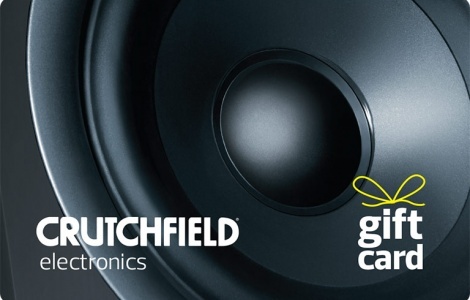 Crutchfield Gift Cards are redeemable at Crutchfield.com, Crutchfield locations, or by calling 1-800-955-3000. Gift Cards cannot be transferred to any other party, cannot be redeemed for cash except where prohibited by law, and cannot be applied as payment to any prior purchase or payment plan. Crutchfield Corporation is not responsible for lost, stolen or unauthorized use of this card. Gift Cards do not have an expiration date. The terms and conditions of Gift Cards are subject to change at any time without prior notice, and are issued in US funds by Crutchfield Corporation. Virginia law applies. For balance information, please call 1-800-955-9091.